Why does it happen? To answer that we need to look at it from the horses point of view. Many people commented that this was happening to them in the arena or when barrel racing. What do these have in common? A pre-definded and predictable path of travel. If you are riding counter-clockwise around the arena for several laps it doesn’t take the horse long to figure out the pattern of; go straight, turn left, go straight, turn left, go straight, turn left, go straight, turn left, go straight, turn left, go straight, turn left. 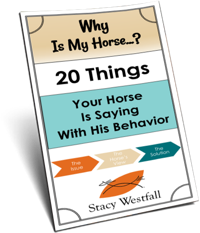 If you have practiced the barrel pattern enough times for your horse to know it then your horse is mentally doing the same thing as the horse above only applied to the barrel pattern. In this example your horse could be thinking; run fast, turn right, run fast, turn left, run fast, turn left run fast! In both examples the horses are dealing with the same thing: anticipation. Viewed from another angle, your horse is really just trying to help you out, lol. On the surface it seems like maybe just changing the routine would be the fix, stop going around the arena or the pattern so many times, but I would argue that the dropped shoulder is most often a stage of training. Attempting to avoid anticipation sounds good…but it isn’t very realistic. 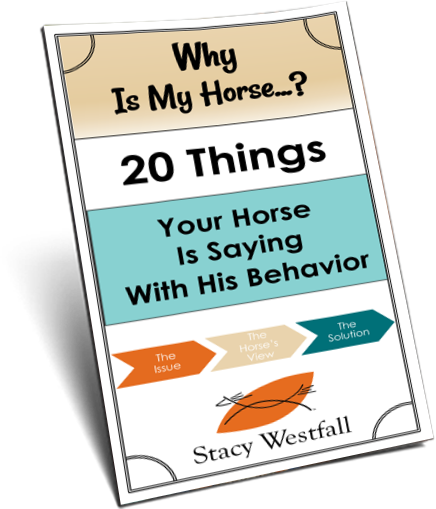 What we really want- and need- is a horse that is mentally mature enough to see something coming (anticipate) and still wait for the rider to give the cue. I have inserted a rough diagram of a pattern I use when I lope in an arena. This pattern allows me to be aware of all three of the points listed above. As a rider, I will be more clear and precise if I have a specific goal. Making it around the arena to the left isn’t specific enough. How many straight lines will I make during this pattern? On each of theses straight lines my focus will be on riding my horse straight ahead, straight between my reins and legs. My eyes will pick a point straight ahead. On two of the curves I will move my horses shoulder out before turning. On the other two turns I will keep him balanced and even. I will be aware if I feel the urge to lean. I will also be aware if I feel the horse lean left or right. 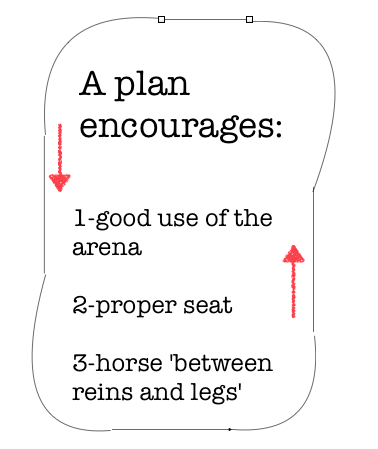 My focus on the pattern has lead to (1. good arena use) which has stopped me from leaning (2. proper seat) and I am aware of (3. horse is between my reins and legs). But what if my horse does lean? What if he doesn’t go straight when I ride him straight? My general rule is that I will help him find the correct answer subtlety once or twice but then I will make a correction. On a straight line that could mean that I pick up to maintain straightness and then let go, notice he is drifting again, pick up to maintain straightness, let go, and then I will pick up and change his path of travel by 6-12 inches while collecting him (the correction). There are many methods for correcting the horse but it becomes slightly less confusing as you begin to realize that you are correcting him for ignoring one of your cues. When the horse ‘drops the shoulder’ many riders are tempted to ‘hold him up’ causing a shift in responsibility. Eventually the rider feels the need to ‘hold him up’ frequently which is also another way of saying that the rider has to “hold the steering wheel slightly turned to the right to keep the car going straight”…. Which cue is your horse ignoring or leaning into? Is he ‘requiring’ you to hold three pounds of pressure with your inside leg to keep him going straight? Can you name three exercises or corrections that you have done in the past that cause the horse to be more respectful of the cue he is ignoring? If not, it might be time for a riding lesson or clinic with a pro. ← What is a 'dropped shoulder' in a horse and how can I fix it?